So, is that one of the Purple Jacket M/M? There are a couple of teams whose faces make me go "why do they look familiar?" but I can't think of who (mostly M/F Khaki Backpacks, Blue F/F, and M/F Brunette. Also M/F African-Canadian w/dreads could possibly be someone famous with incredibly styled hair like that). Could just be a coincidental resemblance, though. Hey guys, I think I may have just identified a racer for ya! Out of curiosity, I checked out the most recent Follows to the Twitter of The Amazing Race Canada and Jon Montgomery (I imagine one of the first things many racers did when they got home was follow the pages of the race and their fellow cast members), and this guy had those 2 as his most recent Follows. And also hasn't tweeted since April 20. His name is Nick (last name unknown) and he's a pro wrestler. But notice his Twitter icon, he has a striking resemblance to the bearded half of Yellow M/M. He is part of a DUO called "FlatLiners"
Do we have any clear pics of his other half? Turns out thanks to ovals timeline we do!! And..just like that ,looks like we have our FIRST team ID!! I overheard one of the Blue M/M talk about Sean, a member on a different team, during their post-leg interview. I really have no clue which team Sean is on. Sean could be a member on a team that was already eliminated for all we know! Last year they didn't start for another week yet. I expect it to be Monday at the earliest, and will follow the same format as last year. A few teams per day. They have still not sent out their press release outlining the grand prizes. Last year, that release was sent out the day before the cast reveal began. But I will still check every day just to be sure! Yep, Mike was more specific today. Nothing yet? Or is it for tonight? Cast reveal will start tommorow. Etalk first airs at 6PM EST, which is still 5 hours from now. That's when you can expect the release. Tues, Wed, Thurs, we'll have those teams by now. They`ll surely update it once the advertised time of 7:30 EST airs. So the blue guy wasn't this Giancarlo he was originally thought to be. I am pretty sure they said "Gino"...The whole segment was QUICK!!! 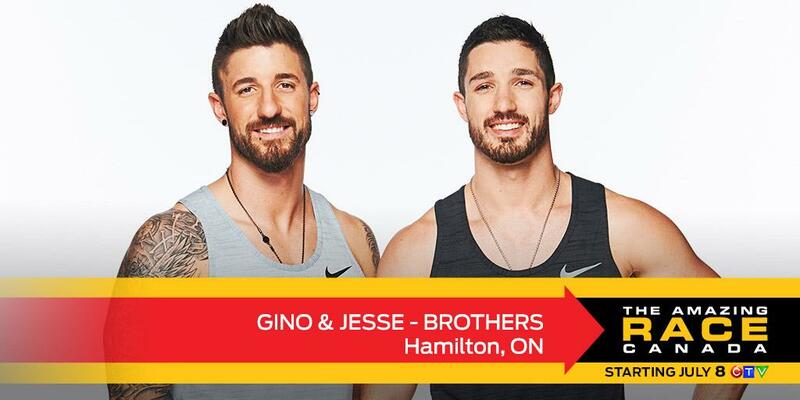 Whoever found out the "Ginocarlo" looks like it turned out the one of the brothers a.k.a. blue M/M IMO. This guy? Looks like him, and definitely has the build.Judging by the twitter of Giancarlo, this picture looks like it could be himhttps://mobile.twitter.com/Feyte15Awesome work from the photographers and people collecting the intel! All of the first 6 teams are from the eastern half of the country, which may indicate that they were going for an east/west split this season. But then I remember we haven't seen the previously-identified wrestlers yet, whose wrestling bio says they're also from Toronto. The casting team put in a real effort in the Maritimes this year, and I think it was due to all the complainers! Another three teams revealed today in the official website including an already-spoiled wrestling team made it in the F3. No they announced the wrestlers full names too: Nick Foti (a.k.a. Asylum) and Matt Giunta (a.k.a. Burns) and Matt's real last name is not Burns. They said their pro names are Asylum & Burns OR The Flatliners....maybe it was just in the press release??? Nick is also an Elementary Teacher, Matt is a Real Estate Agent. Blue Backpack M/M- Best Friends? Blue African Canadian M/F- Dating? FatherDaughter? Older M /Younger F- FatherDaughter? African Canadian M/F with dreads- Siblings?Dating? Blue F/F- Teammates? They look like athletes of some sort. Burgandy Backpack M/F- Motherson? Dating? Engaged? The boy looks like a dancer.